Please remove battery safety paper by turning the switch cap counter clockwise. Insert the Vswab® handle all the way through the swab cavity. 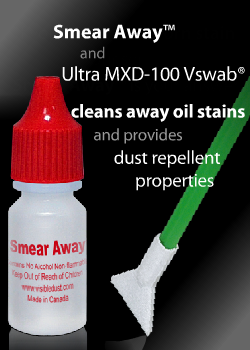 Apply appropriate liquid on the swab (refer to Vswab® instruction by VisibleDust). Turn the SwabLight™ on, adjust focusing beam, proceed with cleaning.